Still spring water with a balanced PH of 7.6. Sourced locally from Somerset’s Mendip Hills and delivered to your home or office door directly from the Aqua Amore London warehouse! Water Works is offering a more sustainable bottled water option in response to growing consumer concern over minimising plastic pollution. Paper used in these cartons is from trees that grow in responsibly managed forests. The caps are made from sugarcane. More empty cartons can be sent to be filled in a single journey VS cans or bottles. This minimises impact on climate change. Water is from a local source and not shipped in from abroad, further contributing to an overall lower carbon footprint. 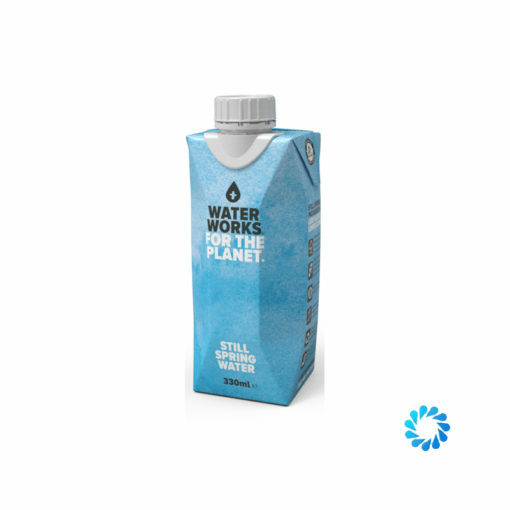 Carton keeps water fresh and cool by sealing out light and air so no need to refrigerate. Lightweight and can be conveniently flattened to take up less space in your recycle bin. Carton and cap can be recycled together. Profits to support efforts that enable positive humanitarian and environmental impact.